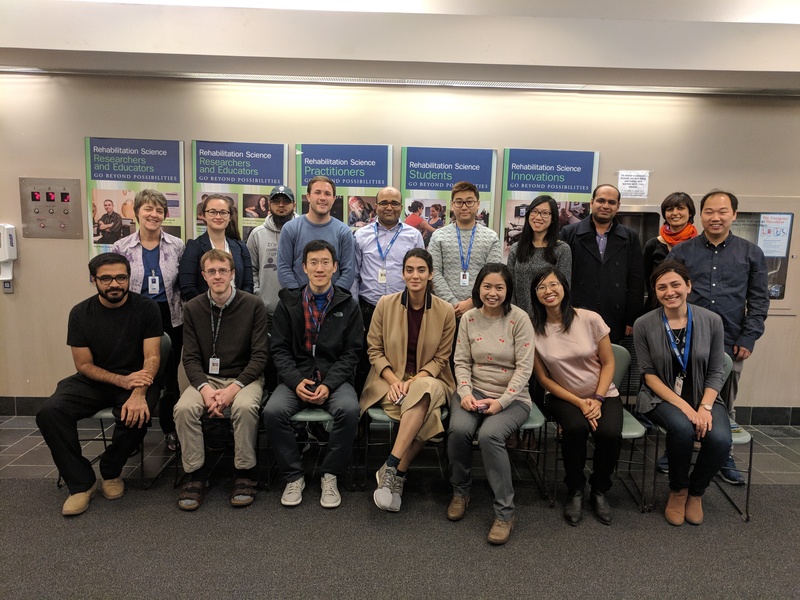 Welcome to the Intelligent Assistive Technology and Systems Lab (IATSL), located in the Department of Occupational Science and Occupational Therapy at the University of Toronto. We are a multi-disciplinary group of researchers with backgrounds in engineering, computer science, occupational therapy, speech-language pathology, and gerontology. Our goal is to develop zero-effort technologies that are adaptive, flexible, and intelligent, to enable users to participate fully in their daily lives. Learn more about our research! We are currently looking for senior research participants to do an interview of technology use in daily activities and social life. We would like to find out about the views of seniors on technology such as computers, mobile telephones and the Internet. The study will be located at 500 University. The study visit will take up to 90 minutes. For more information, please contact Natalia Zdaniuk or at 416-946-8573. For study flyer, please click here. We are looking for a postdoctoral fellow to work in the multi-disciplinary research area of machine learning, computer vision and health informatics. The postdoctoral fellow will primarily work on our current research program on ambient-based physiological monitoring using video images. The position will be based at Toronto Rehabilitation Institute (TRI). For more information of the job, please click here. We are looking for a junior software developer for intelligent systems in health and rehab to join The Artificial Intelligence and Robotics in Rehab (AIRR) Team at Toronto Rehab-UHN and the Intelligent Assistive Technology and Systems Lab (IATSL) at the University of Toronto. The successful candidate will hold a Bachelor’s degree in electrical/computer engineering, computer science, or a related field. The position will be based at Toronto Rehabilitation Institute (TRI). For more information of the position, please click here. Dr. Rosalie Wang presented to a session at United Nations Headquarters in New York focused on digital skills for the aging population. More detail, please click here. Watch the event "Why are Digital Skills Critical for Older Persons" on UN Web TV. Dr. Mihailidis discusses the future of monitoring the health of older adults in their homes. Read the full article here. Dr. Mihailidis speaks with Global News about how robots can help older adults with dementia. The article and video footage can be found here. Congratulations to Alex Mihailidis on his well-deserved Faculty of Medicine Graduate Teaching award! The Honourable Alice Wong, Minister of State (Seniors) announced that the AGE-WELL consortium would receive $36.6 million over five years as part of the federal government’s Networks Centre of Excellence (NCE) program. Congratulations to Dr. Alex Mihailidis and all the AGE-WELL team members! aging at home and assisting people with dementia. IATSL is offering a $5000 stipend to the winning team to develop their robot in our lab. The hackathon will take place Nov 14-16. The new CCNA initiative is committed to supporting synergistic collaboration of the best Canadian research targeting neurodegenerative diseases affecting cognition. Dr. Alex Mihailidis is the team leader for the CCNA's Gerontechnology theme. Dr. Mihailidis is an invited attendee of the global dementia legacy event, which will centre around "Harnessing the Power of Discoveries: Maximizing academia-industry synergies". Discussion themes will centre around optimising collaborations and leveraging technology to support dementia treatment and care. Lab director Alex Mihailidis spoke with The Spark's host, Nora Young, about research underway in IATSL for supporting elder care. Snap ‘n Dose is an app that can be used by caregivers to help administer the appropriate dose of over-the-counter medications to children in a safe and timely manner. The app allows users to take a picture with their phone of the drug identification number (DIN) on every medicine box or bottle, enter their child's age and weight, and get an easy-to-understand dosage for that particular medication. IATSL's Age-CAP, an app that lets users rate how age friendly places and areas of their city are, was covered by TRI's news feed.